Saimatec RoboWrap line of roll wrapping systems, with several patented features, has proven to be a success among customers all over the world. Saimatec has pushed the speed limit even further with the RoboWrap Twin concept. The RoboWrap Twin concept has been developed for the production requirement of 4000 rolls per day. Besides this long-term capacity, catch-up capacity is provided with a design top speed of 200 rolls per hour (cycle time 18 sec or less). All this with top quality wrapping without compromises. This capacity range allows paper mills with high production volumes rethink the layout of the finishing area. With a high-capacity wrapping line with excellent reliability, most mills can now manage their production even with a single roll finishing line. More importantly than a fast cycle speed itself, overall reliability and uptime of the machine play an even more crucial role when aiming at higher-than-ever performance. Mechanical and operational reliability and a robust design have been the trademark of Saimatec wraplines through the history. With special care been put on the layout and design, the solution consisting of proven components has been upgraded with features enabling the system run with as few and as short stops as possible. Certain process parts such as handling of inner and outer heads as well as wrapper material storage for popular sizes have been duplicated, in order to make it possible to run without a stop even if one storage is being refilled. Therefore also the name of the new concept, Robowrap Twin. 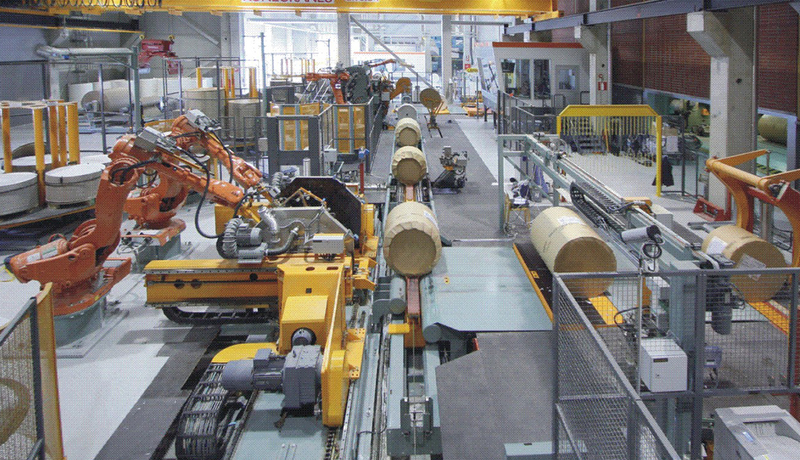 Wrapline is the core of roll finishing process, which is complemented with Saimatec’s full range of other roll handling equipment. These include different types of conveyors, turn-tables, kickers and receivers, intermediate stoppers, vertical conveyors, upenders, storage ramps, winder decks and all other typical equipment. All these come naturally with the same functional robustness and guaranteed quality that is characteristic to the Saimatec wrapline itself. Customer gets the benefit of sourcing the entire roll finishing process with integrated controls and seamless delivery limits from a single supplier.